I got some free 4" elodea densa trimmings last weekend and it went absolutely nuts in my tank (which I am fine with lol). Well I am looking to start trimming and growing it for my pond but I am not sure the best way to trim it. Just cut it with enough length to stick in the substrate and it should grow no problem (as you learned!). Generally speaking, you want to cut just above a leaf node; then the remaining plant stem will start growing two new stems from that point (like a "Y"). Trimming is very healthy for plants. This plant requires no trimming. It is a floating plant which also means it does not require you to plant it. The planted portion will eventually die. Everybody says that but I have personally had this plant root in a dirted tank when planted. I think it depends on the soil/substrate! I had the same plant in flourite clay substrate and the planted portion would melt and it would float up where as this time it is in eco-complete and it is doing just fine and actually rooting into the soil already. Also thank you for the help. I rescaped the tank and trimmed a bunch of it down so I could spread it around the tank! I rescaped the tank the Densa was in since I got my tissue culture crypts order in. I trimmed the plants down so I could spread them around the back more and they look pretty good! Thank you for the help. Yeah. When you google it, it says that if is found in many different sediment types and is hardy enough to survive free floating...which means they find it planted in soil in the wild. It also says that in warmer temeratures it will detach and float. Just a warning, the stuff grows insanely long and quick lol. It shoots out anchor roots. It doesn't grow like a stem plant and just because you have rooted it in substrate doesn't reclassify it as a stem. It's a floating plant bro. Just like najas which can also root. Sorry to keep this going but I like these kinds of debates......tropica classifies it as a stem plant, planted in substrate up to 2" deep like normal stem plants. It's not a true stem plant. When you plant it the plant anchors itself, then portion planted dies, the roots hold it in place while it is technically floating. Unlike most other stem plants, Where the stem converts and produces fine roots for nutrient uptake, Anacharis only roots from the nodes to anchor. Just because you have had a different experience doesnt mean that it gets reclassified. So Tropica is wrong? Everything on google is wrong? Isn't your catch phrase "help me help you....use google"....so find something or somewhere that has it classified as anything else? It is found in many different sediment types in the wild, that means its in the ground and not floating. Warm temperatures will cause it to come loose at the base and float....most peoples tanks are warmer temperatures. I have had anacharis root without the portion under the substrate wrotting away whatsoever, both in just sand with root tabs and in dirt with a sand cap. I have never had it float on me or act as a floating plant. Experience doesnt make fact and people have scientifically classified this plant. Dude, it's like calling water Sprite a true stem plant, it's a floating fern and grows as such. It can be used to mimic background plants, but sends out plant lets, to free float and propagate, just like guppy grass and anacharis will break and split at the node to free float and spread. It's just the way the plants are marketed for sale. So yes you are right the internet is wrong. 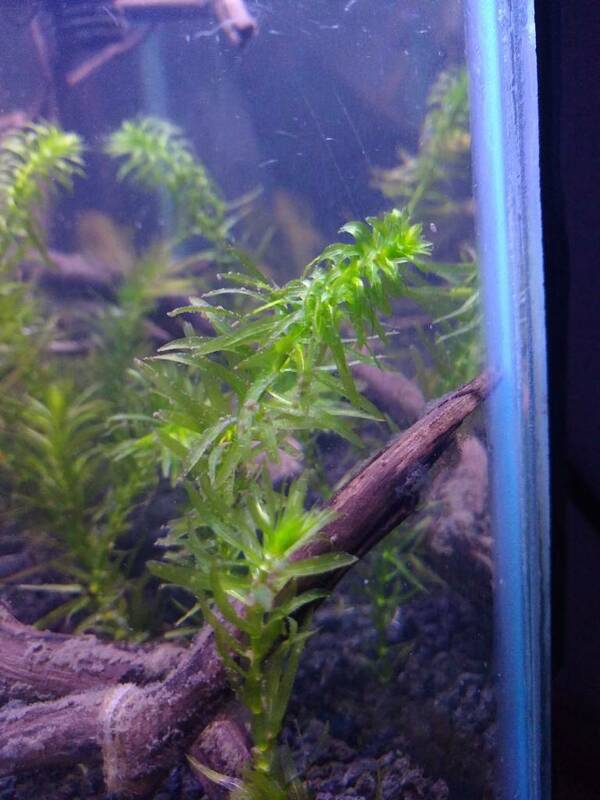 Thats hornwort, not anacharis. Your so stubborn Carlo! I love ya anyways man, lol. Hope you can come out to the next meeting. First it's fake news and now the internet is wrong? I thought his name is "BUCK" ? What is i going on here? I'm confused. LMAO!!! I am enjoying this debate! Lol. I am on board with calling it not a "true" stem plant but I will still say it is a stem plant because it does well in *most* substrates unlike if it were a floater it wouldn't be able to survive planted. Also the plant is a stem with leaves on it right? You can't plant water lettuce or red root floaters in the substrate... That is what I would classify as a floater where as Elodea can be planted. Side note: I love the look of the new growth on this plant! Super dense curled leaves.